Russian President Vladimir Putin’s annual “direct line” conversation with the nation was still going strong when the joking began on social media. “Question: ‘Everyone has had to make cuts to their household budgets recently. What have you cut spending on?’ Putin: ‘On you lot,’” wrote one Twitter user, in a parody of the president’s apparent lack of empathy with millions of ordinary Russians who are suffering as a result of the country’s tanking economy. Others posted doctored photographs of a young woman from the Siberian city of Omsk, who called into April’s televised presidential Q&A session to quiz Putin on why the roads in her hometown were in such a pitiful condition. “She’s having a tough time right now,” went one Twitter meme, accompanied by a Photoshopped image of the woman being buried alive in hot asphalt. Russians have always laughed at their leaders, from the luboks—the colorful satirical prints or etchings sold at markets from the late 17th century on—to the politically charged jokes whispered in kitchens across the Soviet Union. (Example: “Would it be possible to introduce Communism to the United States?” “Yes, but then where would we get our grain from?”) Political humor continued unabated in post-Soviet Russia under President Boris Yeltsin—only now, in the new spirit of openness, it was on prime-time TV. But when Putin came to power in 2000, one of his first targets was an independent television channel called NTV. Renowned for its uncompromising coverage of the Chechen war, NTV also aired a popular political satire show called Kukly (Puppets). 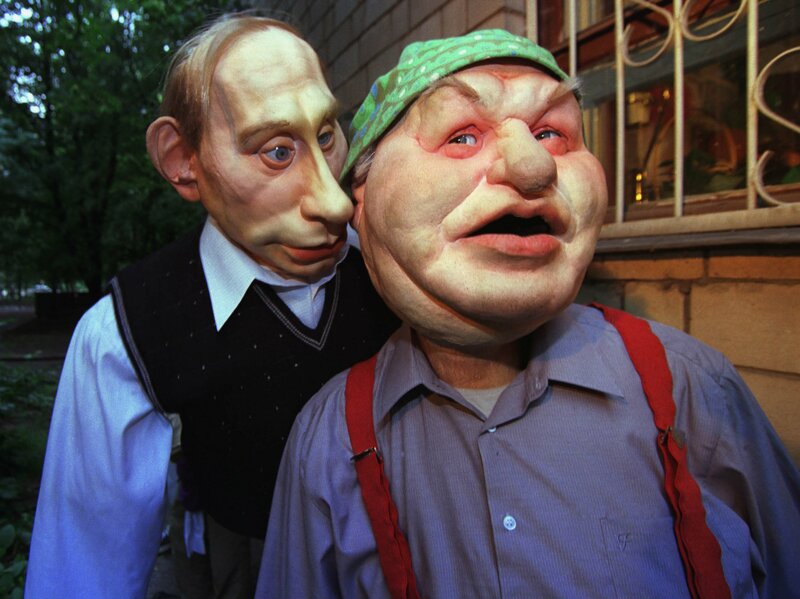 The program featured grotesque latex puppets of high-profile figures, including Russia’s new president. In Kukly’s most infamous episode, broadcast in January 2000, Putin was depicted as an evil, infant gnome muttering the kind of earthy expressions that had built up his tough-guy persona. Putin was reportedly furious, and the removal of his puppet was one of the conditions required by Kremlin aides for the TV channel’s survival. NTV refused to comply, and within months, the channel was under state control. 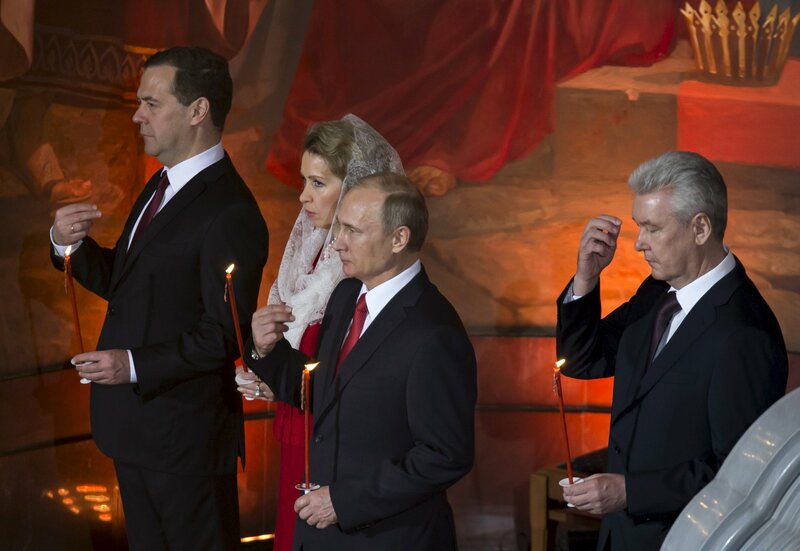 Putin jokes quickly vanished from Russia’s television screens. It wasn’t until about a decade later, with the explosion of high-speed internet in Russia’s major cities, that political satire made a comeback. Anti-government humor was a linchpin of the online communities that emerged in Russia in the run-up to the disputed 2011 parliamentary elections, which sparked the biggest street protests of Putin’s long rule. One opposition Twitter account, @KermlinRussia, launched in 2010, has gained 1.5 million followers with its merciless mockery of Putin and other government officials. 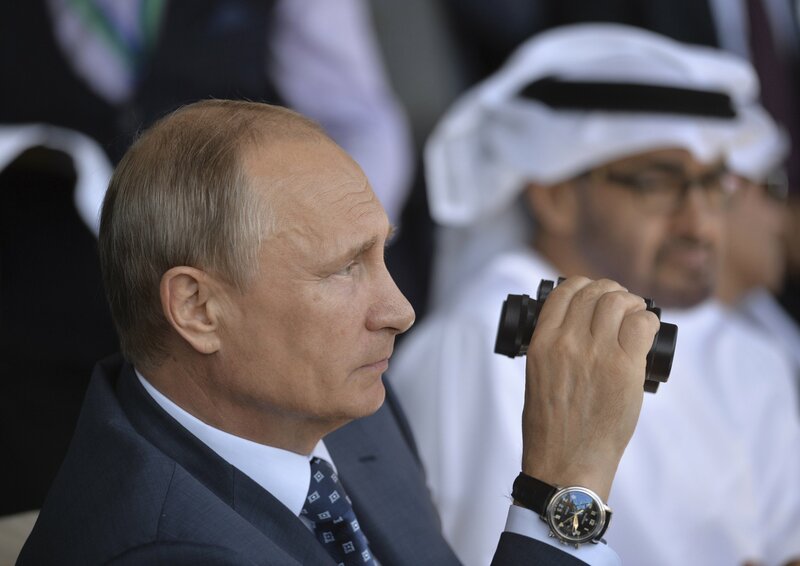 “Putin hasn’t stolen a kopek. What does he need kopeks for?” is one typical @KermlinRussia tweet. 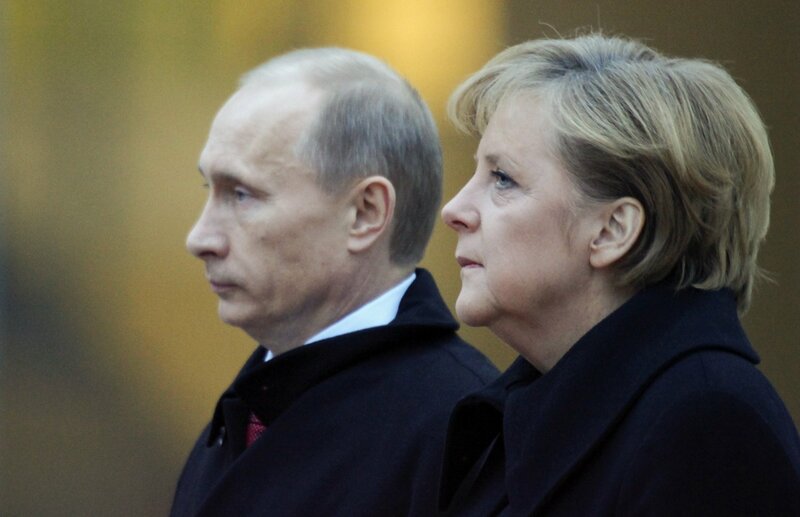 “In reply to the accusation that there are no new faces in politics: Putin has had plastic surgery” is another. But as the Kremlin’s clampdown on dissent has accelerated and traditional forms of protest have become more dangerous, political satire is moving into the streets. From Moscow to Siberia, Russia’s beleaguered opposition movement is fighting state oppression and censorship with a biting and often bleak humor. In recent months, the opposition has taken to plastering bus stop shelters in Moscow with sharply comical anti-government posters. The posters are quickly taken down, but images of them rapidly go viral on social media, spreading their messages far beyond the few hundred people who may have seen them in real life. “What Panama?” read one such poster in early April, after the Panama Papers leaks had implicated a number of Putin’s close associates in a suspected $2 billion money-laundering scheme. 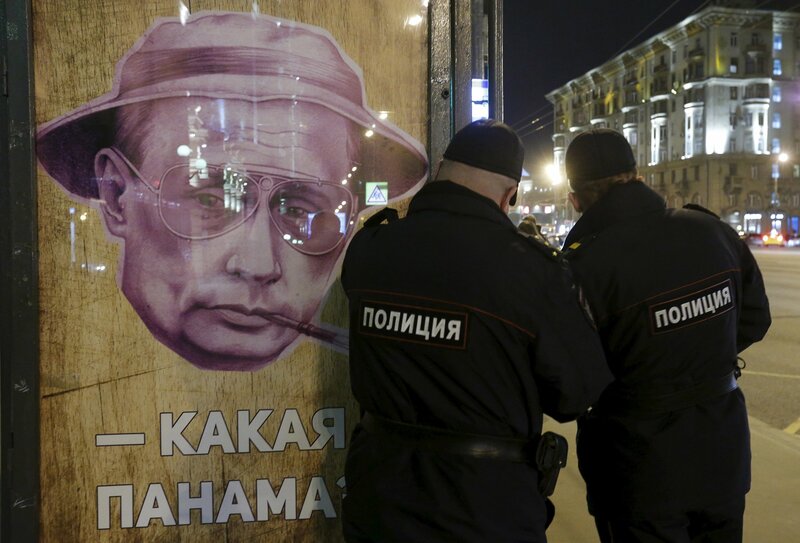 Depicting Putin smoking a cigarette and wearing a white hat, à la Johnny Depp in the cult Hollywood film Fear and Loathing in Las Vegas, the poster was a none-too-subtle dig at state media’s near silence on the alleged plundering of Russia’s national wealth by Putin’s inner circle. It appeared just weeks after another much-discussed poster had greeted passers-by with an image of Josef Stalin’s death mask and the provocative words “That one died. This one will too.” No one has taken responsibility for either poster. “These posters are one of the few remaining ways to publicly express discontent without getting immediately hauled off to jail,” says Yevgeny Levkovich, an anti-Kremlin activist. Levkovich was involved in the creation of another poster that went up around Moscow on the eve of Putin’s annual news conference in December. A mock advertisement for a fictitious pop music concert starring Russia’s long-time leader, it featured a list of “hits”—in reality a litany of Putin’s broken promises on the economy and social issues. Roman Roslovtsev is another Kremlin foe using elements of political satire to highlight injustice. In mid-April, Newsweek watched as he slipped on a rubber Putin mask and strode purposefully through the heart of historic Moscow. In his hands was a sign expressing his opposition to a new law that stipulates up to five years in jail for anyone repeatedly detained on protest-related charges. As Roslovtsev approached Red Square, a smiling passer-by posed for a selfie with him, while other curious onlookers quizzed him on his motivations for this unusual show of dissent. It wasn’t all smiles, though. Within minutes, two grim-faced police officers halted Roslovtsev, and after a brief document check, he was driven off to a nearby police station. This was the seventh time he had been arrested while demonstrating in a Putin mask in just six months. “I’m trying to prove how utterly absurd this new law is,” Roslovtsev told Newsweek after he was released pending a court appearance. “It will be extremely embarrassing for the authorities if they have to imprison me for wearing a Putin mask in central Moscow.” Indeed, perhaps wary of the adverse publicity that jailing “Putin” would bring, the authorities have so far merely charged Roslovtsev with a far less serious public order offense. The humor isn’t always overtly political. In Novosibirsk, in Siberia, Artyom Loskutov, an artist and opposition activist, has been staging so-called monstration rallies for over a decade. They involve up to 5,000 people, and participants at these parodies of protest dress up in strange costumes and hold up signs with such nonsensical slogans as "Oatmeal is evil” and “There will be no carnival!” Occasionally, however, the slogans have clearly been influenced by current events. In 2014, a large banner at the rally read, “Hell is ours!”—a parody of the “Crimea is ours!” slogan that became popular among pro-Kremlin activists after Russia’s annexation of the Ukrainian peninsula. Some participants have simply held up mirrors to reflect what they say is the often bizarre reality of Putin’s Russia. But the authorities don’t appreciate the jokes. This celebration of the absurd has come under increasing pressure. Last year, Loskutov was briefly jailed after holding his monstration rally without official permission. This year, Vladimir Zhirinovsky, a nationalist politician who often gives voice to the Kremlin’s opinions, accused participants of being part of a Western-funded plot to overthrow the government.